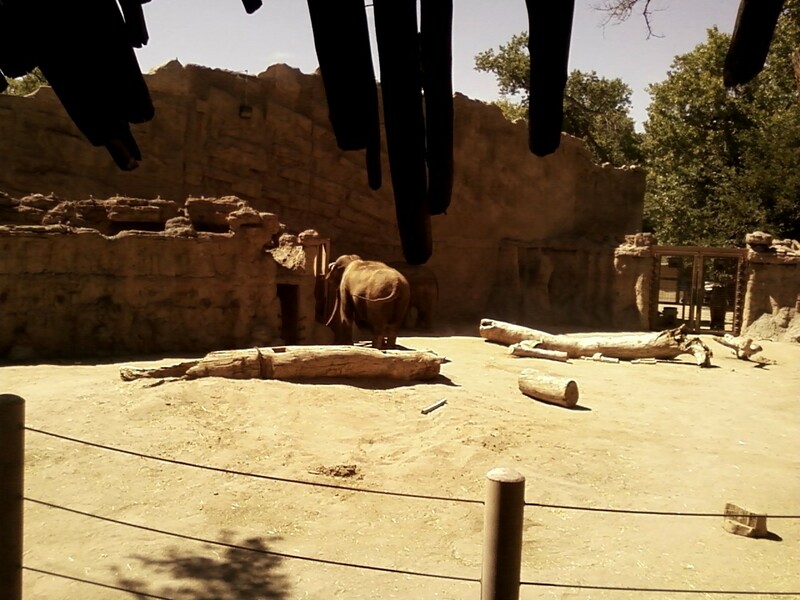 On Monday I decided I would go to the zoo in Albuquerque. I grabbed a change of clothes because I planned to stay there overnight and go to Pecos in the morning, jumped in my car and took off. A word of advice: if you are at the checkstop and they ask you where you are going and you happen to be one young person, do not say "the zoo." It is not a believable answer apparently. I was questioned a lot after answering that. Whatever. I made it to Albuquerque later than I expected and one of my other coworkers from KRUX happened to have the day off. We tried to go to the zoo, but it had already closed its doors. I guess they close early on Mondays for maintenance. Instead we went to the tramway. I went on the tram in El Paso. It was nice. But this one went much, much higher. You end up 10,378 feet high. And the view is amazing. We walked around a bunch. It was very steep. A great workout! There was a bird that would not let me take a picture. Every single time I got close it flew away. Then I would try to sneak up on it and it would fly away before I could get a picture. There is a metaphor in there somewhere. (Check on the top shelf) We checked out where the ski area is and just wandered the forest for a bit. I enjoyed it. That night I stayed at my friend's house. Him and his cousin made dinner. That was awesome. We watched It's Always Sunny in Philadelphia. It was the one where Mac and Charlie die. Actually the name of the episode was Mac and Charlie Die. I can not find the video (you have failed me, Google), but it has one of the funniest scenes in it. I am unable to stop laughing when Mac purposefully crashes his car into the wall thinking he will jump out in time. Oh yeah! I found out Pecos, New Mexico, where I would be going the next day, is where this beer they had at the house is from. Interesting. The next day I woke up at seven and got ready to head out. My dad's side of the family is from the Pecos area. I loved being out there. Of course, since my grandma died a few years ago I have only been back twice (for her's and then my grandpa's funerals). The Pecos National Monument is a great place. My dad actually used to work there during the summers when he was in college. The last time I went he was our tour guide since he knew everything anyway. Okay. Here is the problem. I usually go to this part of the state when with my family. Therefore, my dad is driving. So I can get to my grandma's house just fine. But finding the Monument is totally different. I have never driven there before. The night before I looked up directions. Of course I messed it up. I drove and drove, found a paved road and took it. I saw a sign that said I was entering the Pecos National Forest so I figured I was going the right way. I was not. The road ended at a parking lot with a locked gate keeping me out. So, annoyed again, I drove back on the road, all the way back to where I just was. From there I continued on the other opposite way. What the hell, I figured, if I am going to be lost I may as well just drive and see where I end up. At this point I had all but given up on seeing the Monument. The cool thing is I ran into a giant pink ranch. How often do you see one of those? Suddenly I ran into the road I was supposed to take in the first place. Yeah! I could have given up and gone home, but I did not and instead found a cool pink ranch and the place I was trying to get to. It was just an hour detour. No big deal. Our tour guide was a retired redhead lady from the Midwest. She lived in Rowe, New Mexico. I have family there too. The tour group consisted of myself, two older ladies, one from Santa Fe, the other from Austin, a couple from Switzerland who were traveling along Route 66 on their vacation (they were also giants), and a college group from Glendale College with a whole lot of really cute girls. The day was nice, not too hot. We began the tour. I can not begin to explain to you how much I love this place. Aside from Carlsbad Caverns, this is my favorite place in the world. It smells incredible. You can see everything. As the guide told us the history, I could imagine all these people who ruled their corner of the world and what their everyday lives must have been. People wake up, smile, eat, breathe, love, hate, work, sleep. All of it. All of that happened to thousands of people for a very long time. And now there is very little physically remaining. Outside this wall the Pecos kept outsiders. Even the people they traded with (and this was a major trading spot) had to do everything out there. This is the same clearing. Imagine all the people bringing their goods and trading in this same spot not that long ago. There is a hole you get to go down here too. It was used as a meeting place. They have waterproofed and restored the place, but otherwise it looks just like it would have back then. That is an interesting experience. The tour group was all down in here. After we were done listening to the tour guide, everybody went back out one by one. I wanted to go last so I could take pictures without anyone in the way. However there was only one girl in there with me at the end. She was wearing a dress. I am pretty sure she did not want me looking up there because she nervously asked me to go first. Rather than explain why I wanted to go last, I just left and came back later. The light was not as good then, but oh well. Do I look like that much of a creep though!?! As they say, the tour must go on. (Nobody says that) Most of the ruins here are...ruined. They were built of material that needed constant work to stay standing. So, while at the time the pueblo stood at four stories, now this is all that is left. The picture below shows the bit left and the sign depicting what it used to look like in the same spot based on Spanish notes about the area. Eventually we came upon an old Spanish church. This stayed standing because the Spanish used bricks. The building you see now is actually the second church built. When the Spanish first came to the area they were greeted as friends. Since the Spanish were looking for cities of gold, the Pecos sent them off to Kansas, intending them to die in the middle of nowhere. That did not happen. The Spanish realized they had been fooled and left. Decades later a different group of Spanish returned and claimed the area, building a giant church at the pueblo. At the time the pueblo was a busy and well populated. However, a massive revolt by various pueblo groups banished the Spanish from the region. The church was destroyed. That would not be the end though. The Spanish returned a dozen years later and established a smaller church in the same place the first one had been. In the next picture you can see the second church still standing and the foundation of the first. The two older ladies were the first in our group to check the place out. And that was just about the end of the tour. Remember I said I had to go back to take pictures when nobody was around? I went to do that. After getting all the shots I wanted I started walking back to the visitor's center. Along the way I passed a bench with a couple, probably in the 70s, sitting. As I passed the man put on his sunglasses and asked his wife, "Do you think I look good in these?" She replied, "I think you look great." It was the sweetest thing to see that he cared how he looked to her and that she still liked the way he looked. Geez. I loved hearing that. They were just sitting there taking in the view and enjoying one another's company. Anyway, I got back to the visitor's center and checked out all the artifacts they had. I also bought two books: Bless Me Ultima and Kiva, Cross & Crown: The Pecos Indians and New Mexico, 1540-1840. Apparently my dad bought Kiva, Cross & Crown a long time ago, but it is put away somewhere. Meh. Now I have a copy I guess. And I read Bless Me Ultima early in high school. It is about where my family is from and I knew that from the towns and cities they would talk about. One thing I remember about the book in particular, for some reason they have to go to Las Vegas quickly. Now, there is a town very near Pecos called Las Vegas. It is not the Nevada one. I have been there many times for church. I told my teacher that because she kept referring to it as the one in Nevada, but it would take forever to get to that city! It does not make any sense. She refused to believe me. Luckily, I know I am right about everything. SO THERE. By this time it was not even one in the afternoon yet. I decided to see if I could make it to the zoo on time. Luckily I did. I grabbed some pizza inside and had a few hours until they closed. The only thing different on this trip to the zoo was the elephant exhibit was finally ready. I also mistook a duck for an elephant... ("Hm... I don't see the African elephants. Wait! There's one! Nope. That was a duck...") After seeing everything I wanted I took a nap in the grass field in the park at the zoo and left for El Paso. As I passed into Las Cruces I went to my friend's house. She gave me a copy of Abbey Road on vinyl. Yeah! It must have rained before I got there because the streets were all very wet. Just my luck to miss the rain...Then I drove to El Paso. There was a large amount of traffic trying to get onto Loop 375 because they had closed a bunch of lanes off. I almost fell asleep a few times waiting to move. Finally I made my way home, tired as heck, but happy. I hope mine are half as decent when I make my way to New Mexico next month. They will be because you're a talented journalist! You will. Don't worry about it.